Our elegant, private event Lounge. Welcome to LA TRAVIATA, where the essence of downtown Long Beach and exquisite, affordable dining meet. Celebrating 20 years in Long Beach. With a state of the art restaurant and banquet facility, including multimedia, wifi, big screens, and a sound system that can accommodate any event from a small cocktail party, to a large corporate or wedding party up to 120 guests without the hidden costs. Spectacular Space, Full bar, Marble Floors and Custom Woodwork. The Ultimate Upscale Speakeasy ambience. Please contact us for complete terms & conditions. Deposit Required at time of confirmation. For the balance of the package (Visa, MC, Amex, Discover). Our Award winning Restaurant provides your guests with an excellent selection of Nuevo-Italian cuisine in our spectacular Lounge Space. Utilize our audio-visual installation for presentations or add live music for DJ for entertainment. Full bar, big screens. Our Award winning Restaurant provides your guests with an excellent selection of Nuevo-Italian cuisine in our spectacular Lounge Space. Utilize our audio-visual installation for presentations or add live music or DJ for entertainment. Full bar, big screens. A special Buffet area allows comfortable self-serve space for your guests. Carving Station optional. Design your own Menu. Our Award winning Restaurant provides your guests with an excellent selection of Nuevo-Italian cuisine in our spectacular Lounge Space. Utilize our audio-visual installation for presentations or add live music or DJ for entertainment. Full bar, big screens. A spectacular space with Marble Floors and Custom Woodwork for an unforgettable wedding. Our Chefs provide your guests with an excellent selection of Nuevo-Italian cuisine in our spectacular Lounge Space. For 20 years LA TRAVIATA has been helping our clients design spectacular weddings and receptions. Utilize our audio-visual installation for special effect and add live music or DJ for a perfect experience. Full bar, big screens. Nothing pleases us more than having you celebrate special occasions with us. Whether it’s a business meeting or a family affair, we have one of the most excellent banquet services in Long Beach. You and your guests will surely feel cozy in any of our fabulously gorgeous private rooms. We also have extensive lunch and dinner menus for every budget. Give us a call and we will help you plan an incredible lunch or dinner party. 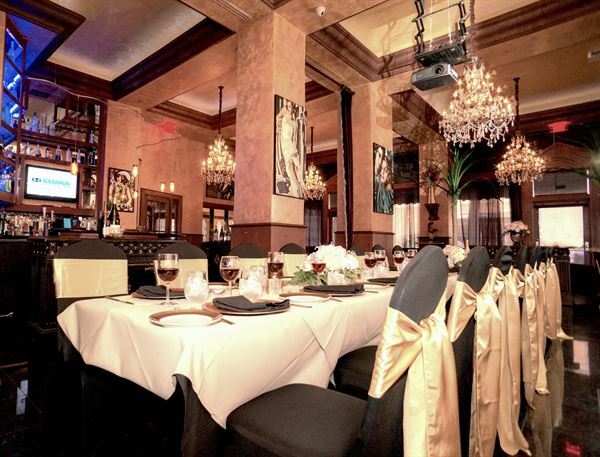 Atmosphere/Decor: La Traviata, a gorgeous Lounge with marble floors and custom woodwork that channels upscale "Speakeasy" where the essence of downtown Long Beach and exquisite, affordable dining meet. Located in the prestigious and long standing Willmore Building. Mario the owner made sure every detail was perfect from planning through event completion. Top notch staff, food, decor. Could not have been better!! !